Since I’ve started this blog I’ve been receiving really great feedback, not only from you, the readers, but also from some of my family members that I shared my blog with over emails and facebook. One of the greatest feelings is knowing that you’ve helped someone make a positive change in order to have a happier, less cluttered life. My mother just recently sent me a picture of a table that’s along the wall in her dinning room. 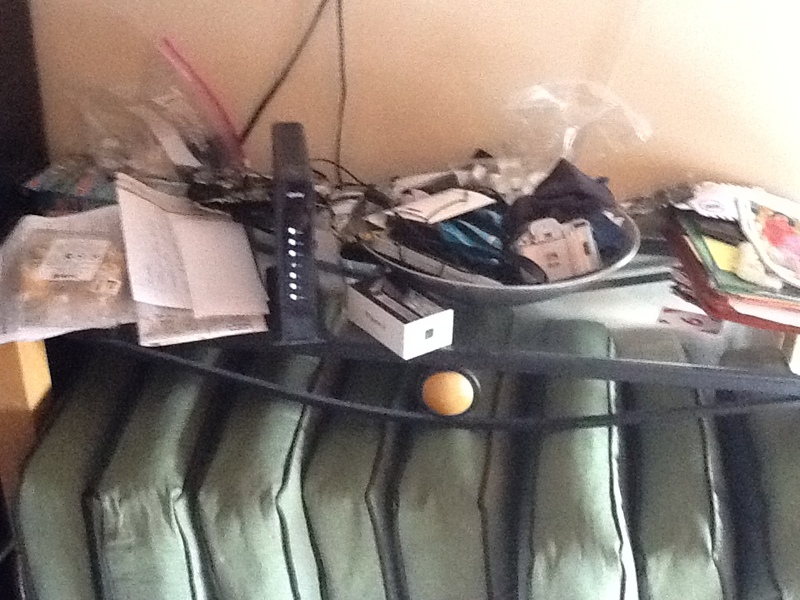 It was cluttered with magazines, mail, reading glasses, iphone accessories, etc. You name it and it could probably be found on this table. My mom doesn’t ask me for advice often so the fact that she asked me what she should do and the fact that I had so many ideas of ways to clean up the space made my day! I was texting her ideas and links to baskets and boxes on Amazon and just being a super big dork because I was so excited about this. So Sunday she texted me another picture. What an improvement! It looks so good and I’m so happy that 1) my mom asked for my advice 2) took my advice and 3) was awesome enough to take before and after pictures so I could blog about it! -haha. It’s motivated me to really step up my game around my own house. Some days I feel like I may come off a little “preachy” with some of my tips and solutions when in reality my apartment is no where near perfect! I’ve been sick for the past week and a half so I’ve been slacking a little bit with my Clean Out Your Closet challenge, but now that I’m feeling better there should be nothing stopping me! I’m going to help you sort through that mail! 1. What you want to do is set up a mail station in your home. Maybe near your front door or in your home office space. Something simple like a basket or open box. 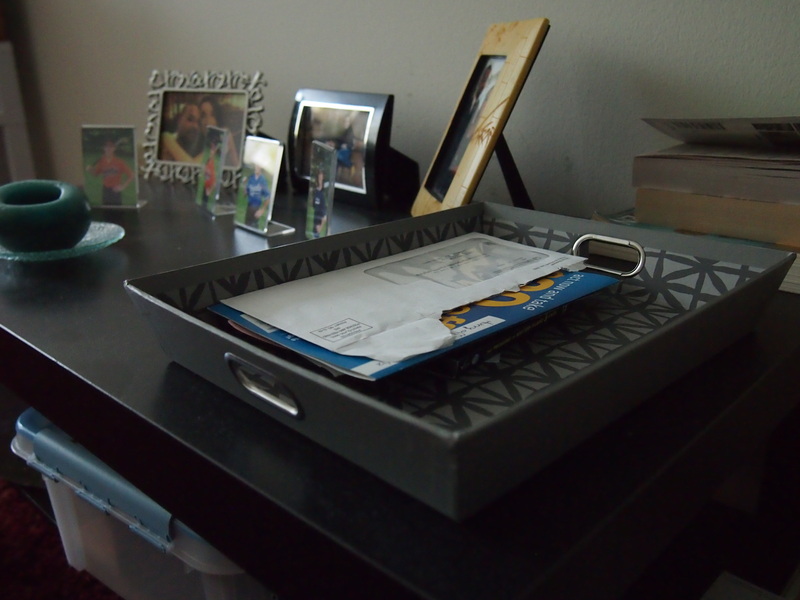 I have my mail tray right near the front door and usually I’ll just drop everything off in the tray when I come home. 2. Sort through all the mail immediately. This doesn’t mean that you have to open every piece of mail as soon as you walk through the door but it does mean that you should finger through it. Put the mail into piles as you go. One pile should be for mail that you need to act on, like bills for example. Another pile should be for filing, like bank statements. And the last pile should be your garbage pile. 3. Recycle junk mail without even opening it! I get a lot of junk mail from Vonage and State Farm and stuff. Since my mail box is on the other side of my apartment building I usually just toss my junk mail in the dumpster before I even step foot in the house. 4. Once I’m done going through all my mail I’ll usually put whatever I need to keep back in the tray and go through it at the end of the week. Any bills I receive I’ll pay online, any statements I get I’ll file them away, and any advertisements that I want to look at will go in the tray as well. When I get home on Friday afternoon everything is pretty much all sorted out and all I need to do is act on it. It’s pretty simple! There’s no need to have piles and piles of mail laying around. But if you are throwing away junk mail or any other mail that contains any personal identification information make sure you shred it or rip it up really good, because identity theft is no joke! Also, if you feel that you’re receiving a lot of junk mail you can go to the Direct Marketing Association website and fill out a form to remove yourself from a lot of the mass mailing lists. Like this one for example. 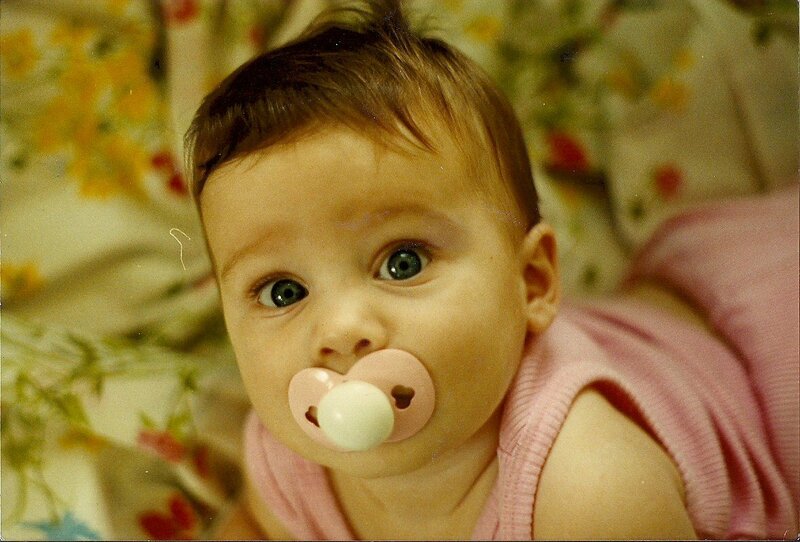 Wasn’t I the cutest baby?! Anyways, for Christmas last year I got a pretty nice camera, the Olympus Pen Mini, and I’ve been trying to take lots of pictures at holiday parties and family events because when I have kids I want them to get excited about rummaging through a box filled with old photos too! 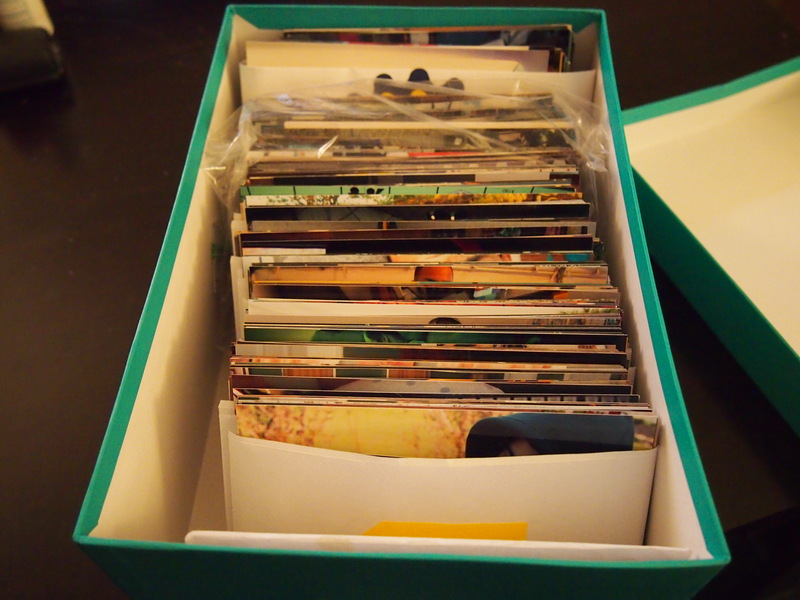 But I’ve decided that maybe instead of an old, beat up box, I’ll store my pictures in really pretty photo boxes! I got these at AC Moore, 5 for $10. I thought it was a pretty good deal. They had all different types of patterns and colors but I chose these, pretty much because they were the easiest to grab. AC Moore always has some kinda deal going on with photo boxes so if you’re ever in the market to buy some, check with them first. 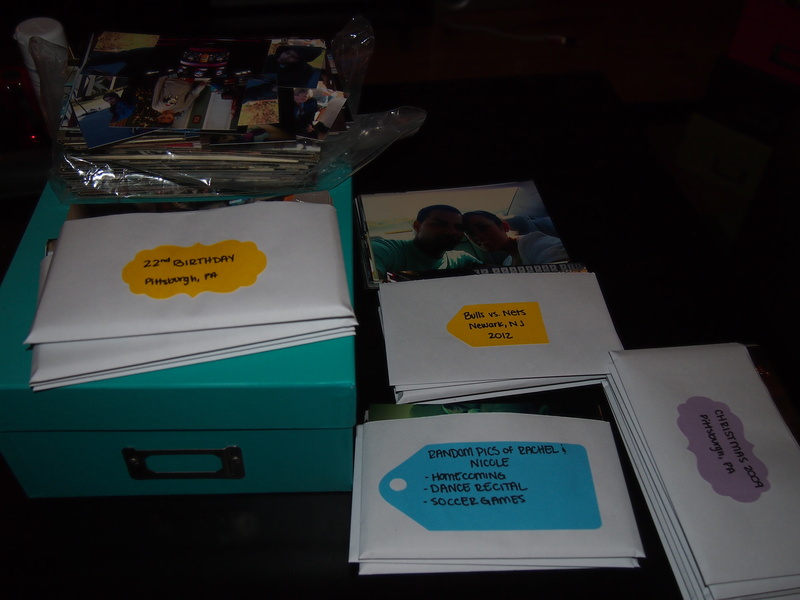 For this project I also used #6 envelopes, some mod podge, some labels I made on my Cricut, and of course all my photos! 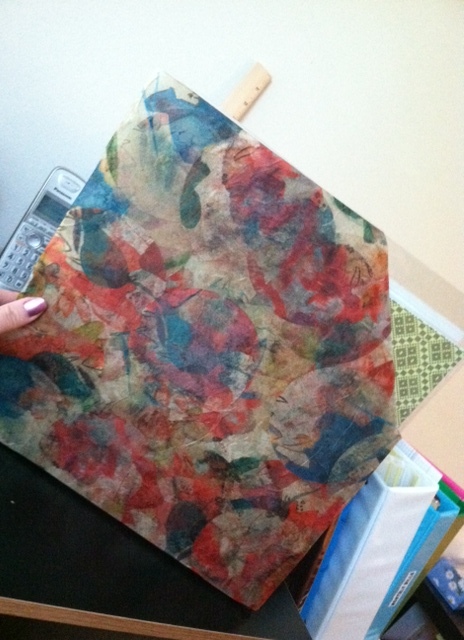 I used #6 envelopes because all of my pictures are 4 x 6 and the boxes don’t hold 5 x 7 photos unless they’re laying down. 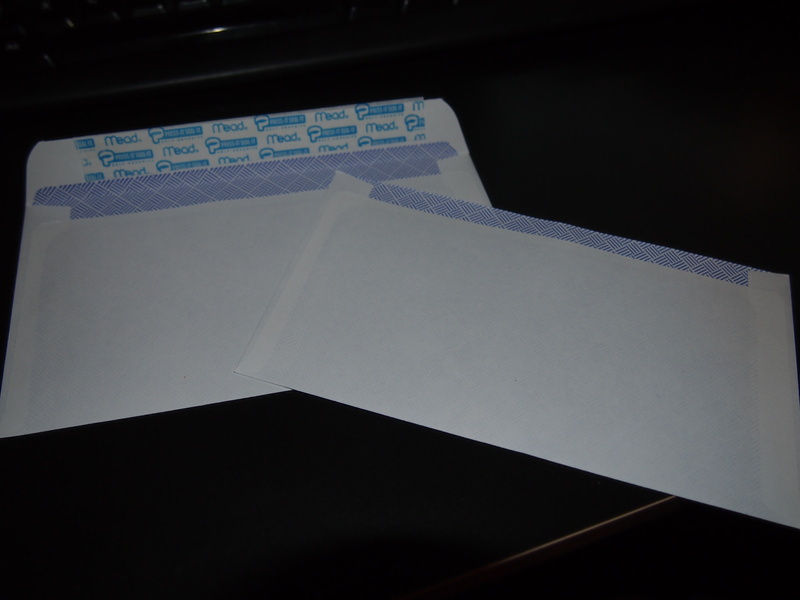 I ended up cutting off the top flap of the envelopes because they just got in the way. 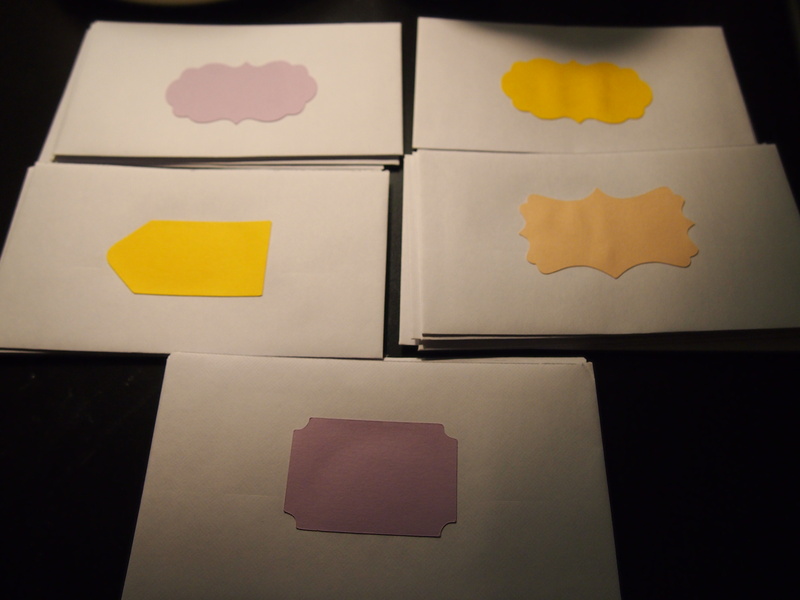 After all the flaps were cut off I glued my labels to the front of the envelopes. You don’t need labels, I just figured it would look prettier this way. 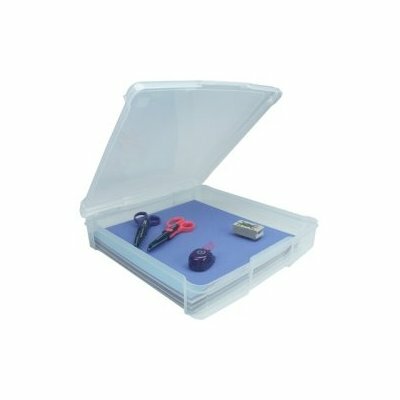 Now all you need is your boxes and all of your pictures! This is the fun part. You have to go through all of your pictures and group them into categories or events. For examples, I grouped all of my Christmas pictures together, all of my trips back to Pittsburgh, and so on and then I went through each category and sorted them by year or event. If you have lots and lots of photos this could take awhile so break it up into groups. 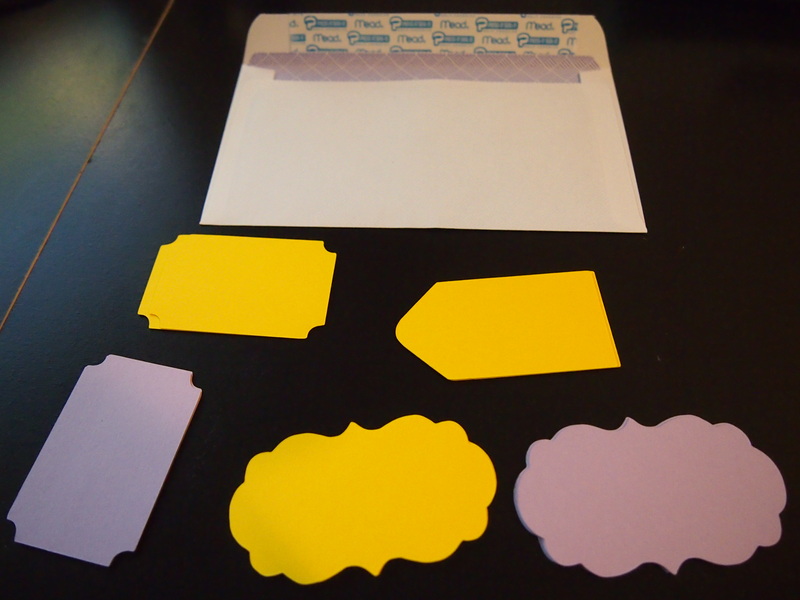 Once you’re done put them in an envelope and label the envelope with the Holiday and year or the event and location. And that’s it! 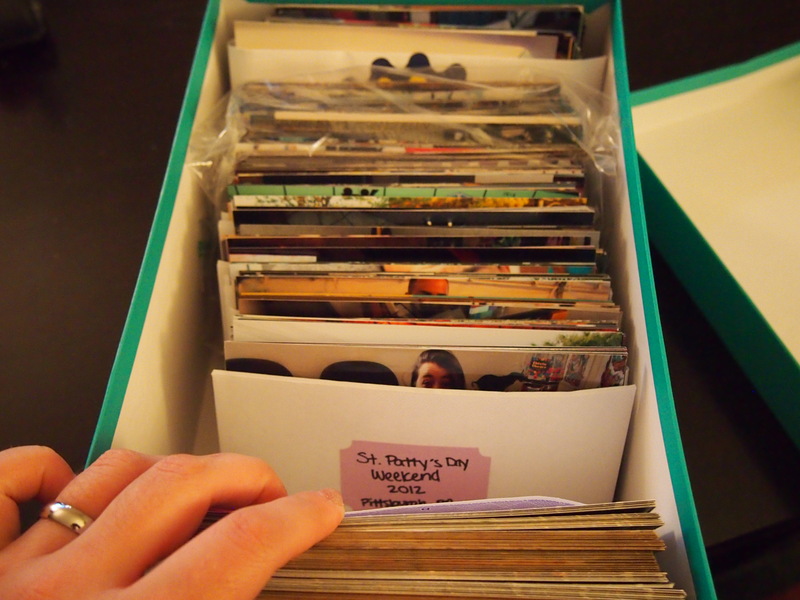 If you have tons of pictures you can designate a box just for holidays or just for vacations or birthdays or you can just label the box with a specific year and fill it with New Years, Valentines Day, 4th of July, Christmas, etc for that year. I hope this helps with some of your photo storage needs! The new Ikea catalog is out! I received mine in the mail but you can also view it online. Go check it out! In my last post I told you that all this month I’ll be cleaning out and organizing all the closets in my apartment. 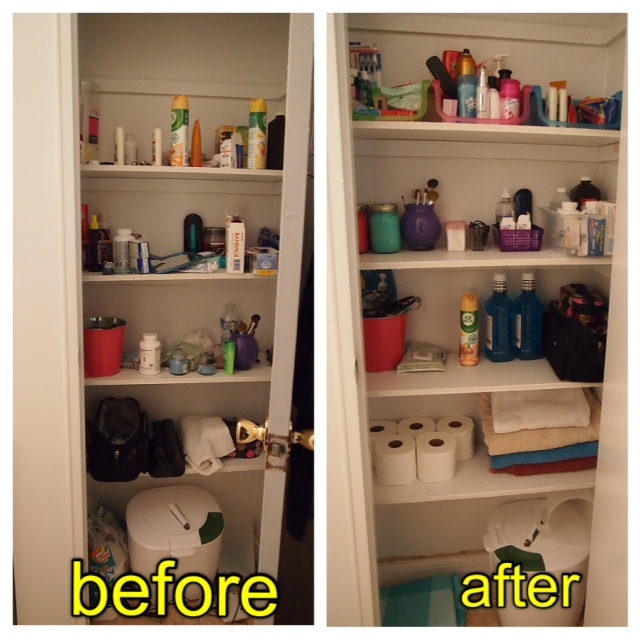 Well I’ve already completed the bathroom closet! It’s not a huge accomplishment because 1) it’s the smallest closet in my apartment and 2) it wasn’t so so so bad and it only took me like an hour or so. But it felt really good. I went in there motivated and determined to throw a lot of stuff away and I did! And just like that, I was done going through all the shelves. I dusted them off and then got a few storage bins that I had gotten from the dollar store last week. The green bin is for travel size items. Sam and I don’t “travel” in the traditional sense a lot but we do go to Atlantic City for the weekend and take over night trips places so they’re good to have. 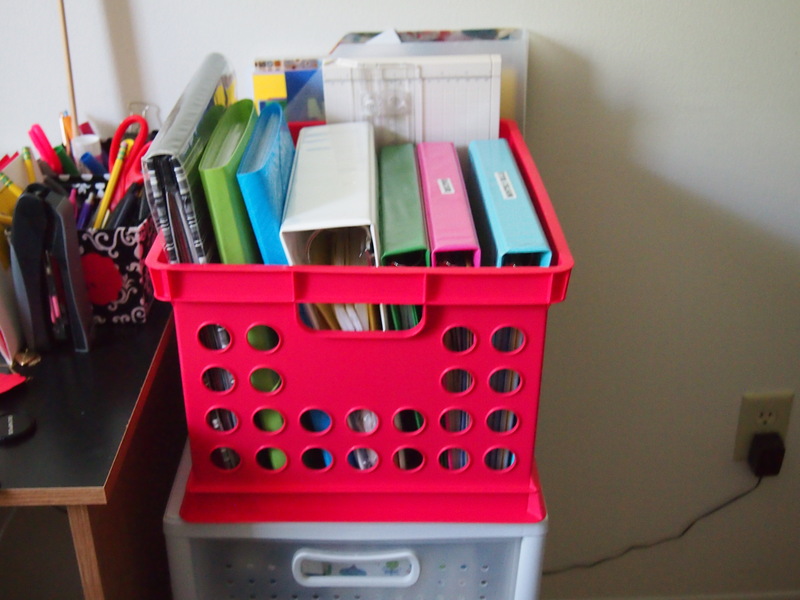 The pink bin is all of my stuff. I made sure to put all the stuff that I use daily or more often in the front so I don’t have to dig through the bin all the time. The blue bin is Sam’s stuff. Everything is in arms reach from the sink. Easy to take things out of the bins and easy throw back in. 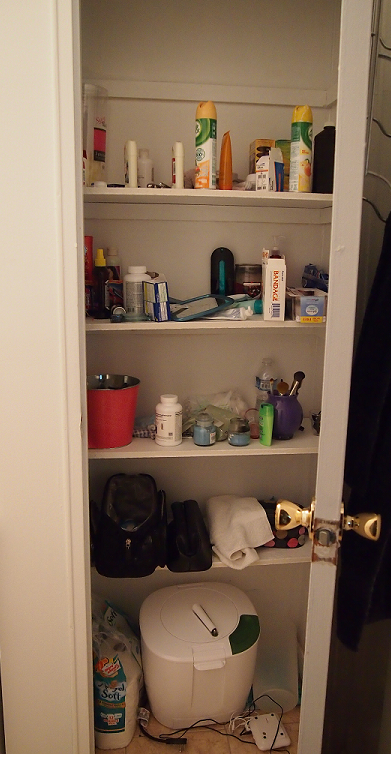 The second shelf is designated for our contacts, solution, and extra contact cases. We also put our first-aid/medicine box here. I wanted to put my hair ties and bobby pins on this shelf because I didn’t want to have small things on the top shelf where I’d have to shuffle around to get them. And finally some of my makeup brushes. I decided to put my mason jars containing all the q-tips, cotton balls, cotton swabs, and makeup sponges in the closet and free up some space on my bathroom vanity. Third shelf is for our toiletry travel bags, extra mouth wash, air freshner and soap, along with Sam’s hair cutting stuff and shower mirror. The end result! I’m pretty happy with it. Getting rid of the extra junk and putting the remaining items in some kind of order was fairly easy. All the storage that I used in this closet cost me $3 as the bins that I used on the top shelf only cost $1 at the Dollar Tree. Normally I would clean out the space and sort things into keep piles and then go shopping for storage but I couldn’t pass up some cute storage bins – hahaha! I’ve decided that over the next couple weekends I’m going to work on organizing my closets. August will unofficially be my Clean Out Your Closet month. 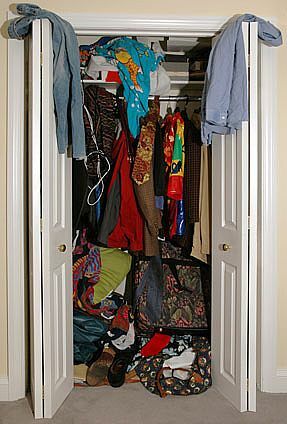 I only have three closets in my apartment so it shouldn’t take me too long (knocks on wood). 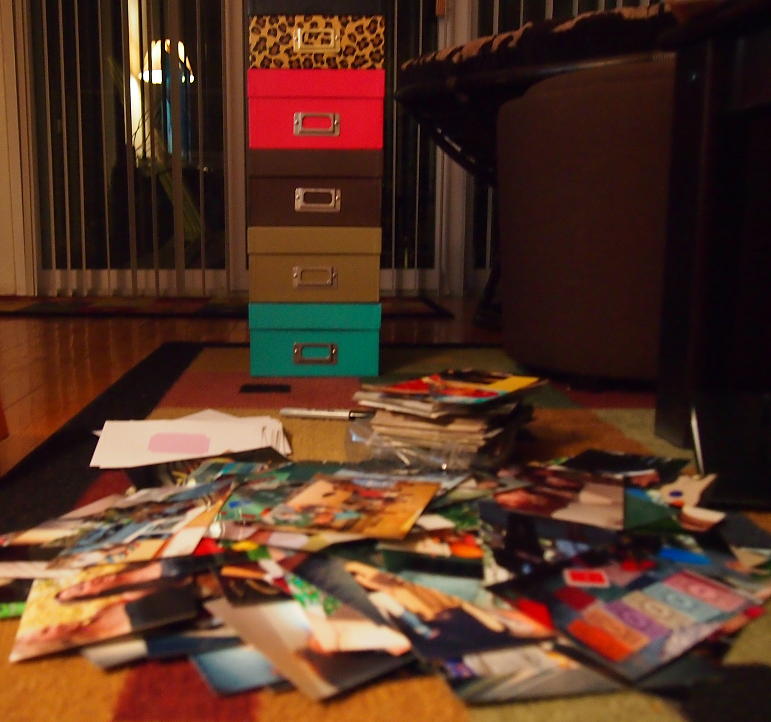 The only part I’m dreading is the horrid first step of organization… PURGING! I’m really bad at it because I can find uses for a lot of things that other people would consider junk, so when other people have no problem throwing something away, I have to really think about it – HAHA!.. I thought that others may have a problem purging also, so I’ve put together a short list to get you started. 1. You need to find out how much time you want to devote to your organization project. For me and my closet clean out I’ll probably devote a whole weekend but some people may get too overwhelmed. If that is the case for you, just start small. Purge a little bit here and there in 30 minute chunks or maybe take an hour out of your afternoon to get going. 2. You’re going to need to create 4 groups. 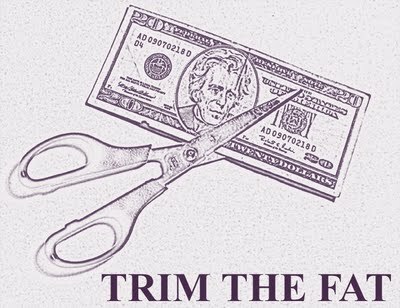 Items to keep, items to sell/donate, items to fix, and items to throw away. 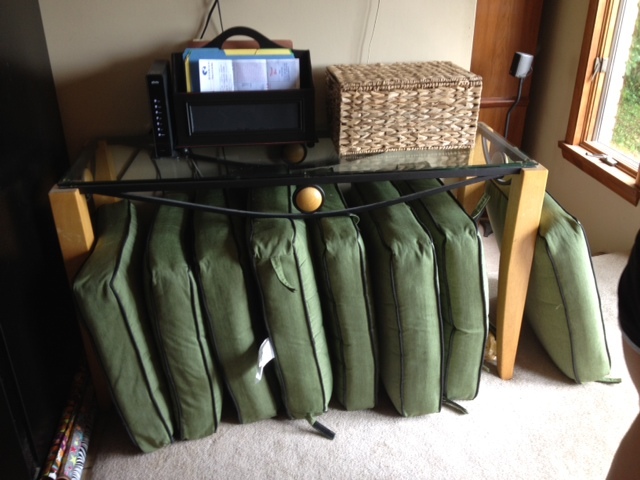 You may also need a pile for stuff that is just out of place and needs to be returned to it’s designated spot. As soon as you’re done sorting out what needs to go where, it’s time to get that stuff OUT! Take the items that you’re throwing away straight out to the trash can. The items that you’re going to donate or give away should go into a box in the trunk of your car. And the items that were misplaced should be put back into their appropriate spots. 3. If you have any items that need to be repaired give yourself a three month deadline. If the items are not fixed within that three months, toss ’em! 4. The same goes for any items that you may have trouble getting rid of. Let’s say that there’s a vase that you like but haven’t used in a long time but you still really like it. Put it in a box and put it up in a closet, in the attic, or out in the garage for a year. If you haven’t taken it out to use it then it’ll be easier for you to throw away or give away once the year is up. I hope that these easy tips help with any of your organization projects that you have going this summer and stay tuned for my August Closet Clean Out posts! 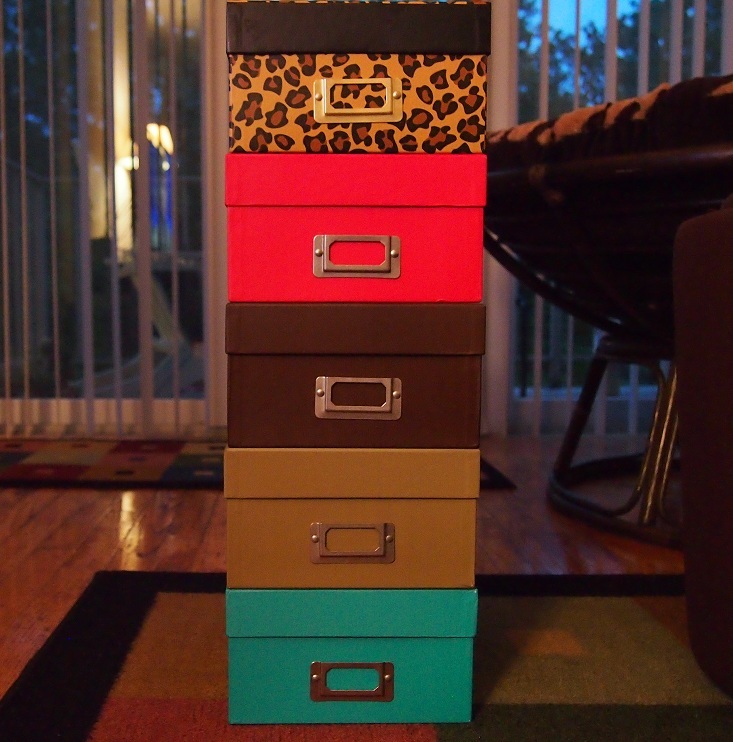 Storage crates/boxes are one of my absolute favorite things! 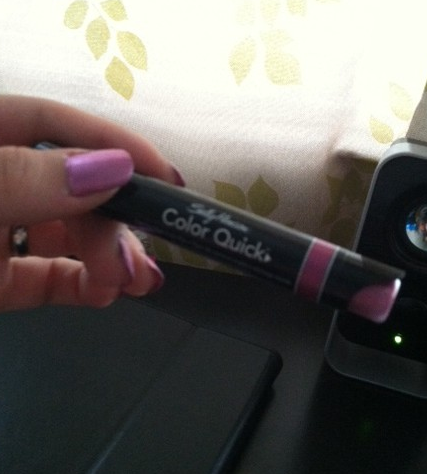 They make everything so much more simpler to find and store. This week at Target they have storage crates on sale for $3! 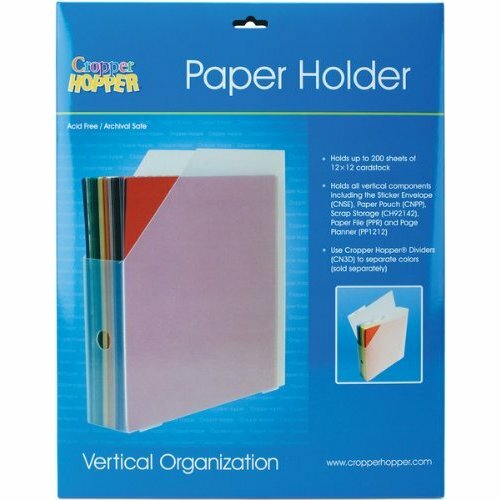 you can store anything and they even hold letter size hanging files which is awesome. I have a ton of magazines in the bottom drawer of my white storage set that I’m in the middle of throwing away but any time I would open that drawer all of my binders on top would fall over so I used one of the storage bins to help me out until I can get rid of the magazines. 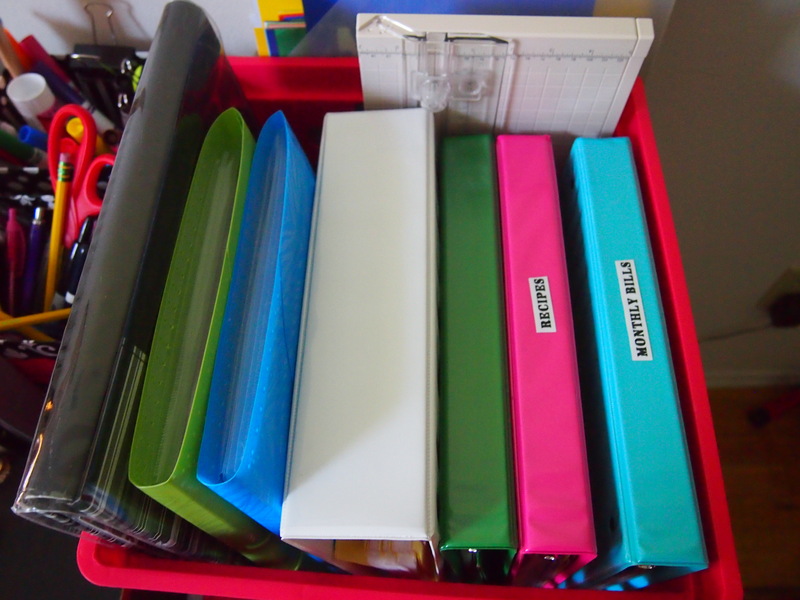 I really like it because I can store my binders on the their sides and it’s easy to see which binder is which and also easier to just grab and go. 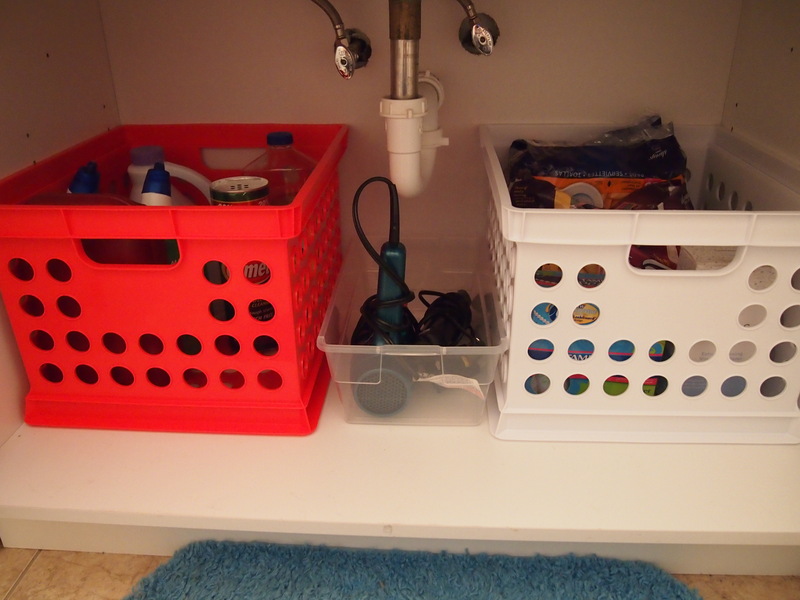 It’s also really great storage for under the sink in my bathroom. 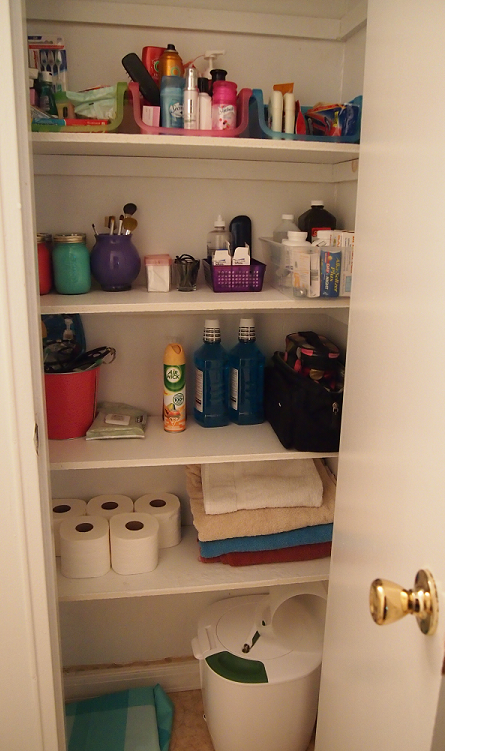 I can store cleaning products in one and feminine products in the other and it saves me a lot of room in my bathroom closet for all the other junk that’s taking up too much space. Btw, sorry for leaving the blog hanging the past couple days. I was out of town late last week and then just been a little busy this week. I’m trying to re-re-arrange my office area again. Yes, I said re-re-arrange. Looking for a big desk or craft table and having no luck but I have a few projects coming up that I’m excited about and excited to share with all of you! Isn’t it pretty? And it was only $1.69! 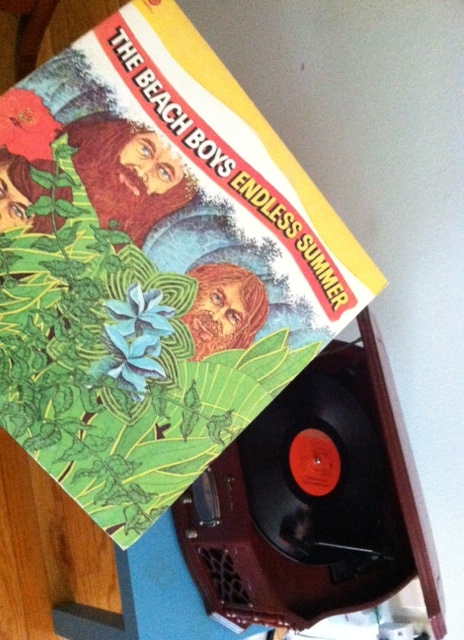 I was never a huge Beach Boys fan until I found this vinyl. They’re amazing! But that’s pretty much the highlights of my weekend. I did find a little time to work on a few projects for a few posts this coming week so stay tuned! Especially if you love mason jars and scrapbook paper storage! Hahaa. 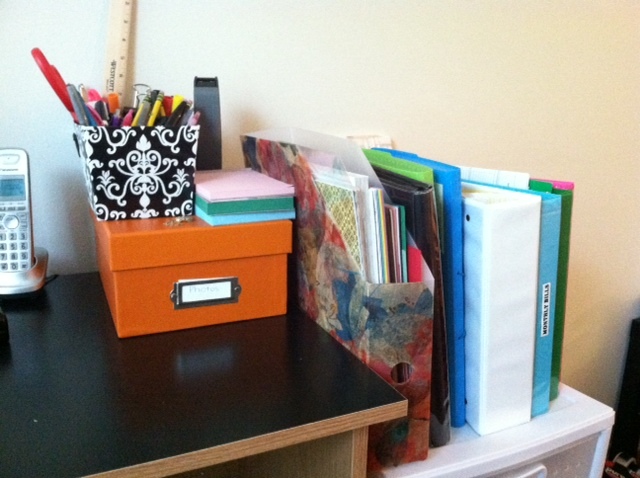 I hope all of you have had a great weekend and I can’t wait to share my new organizational ideas with you this week!